Already it is the 17th of Ramadhan and Mr S and I are starting to feel the lethargy that only people who have fasted for days and have not had enough sleep could feel. It's normally the middle of the fasting month that it gets bad for me; the early part being supported by the initial excitement of Ramadhan, and the thrill and rush to be on track reading the Quran, whilst towards the end, I get rejuvenated by the fact that Eid is near and Oh dear! What a lot of tidying, cooking and cleaning for me to do! So yes, right about now, I would and should be feeling sluggish, and truth be told, all I want to do right now is lie under my comfy duvet and just sleep! Just want to update everyone ont the boys. They have been following their 'plan' albeit not according to the allocated times and progress hasbeen a bit slow because they're doing it mostly on their own without my constant supervision. And oh yes, the reading Quran after Subuh thing? The boys could hardly open their eyes during sahur and fajr prayers so reading Quran afterwards is completely out of the question! Takpelah...at least they are reading and revising the Surahs they have memorized at the madrasah every morning. That is good enough, I think. I have also added something else to their list of things to do. 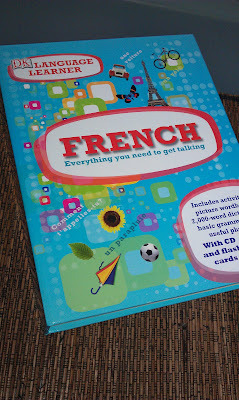 Bought this 'Learn To Speak French' thing for them a few months ago that comes with a CD and card game and I thought when else would be best for them to do it but now - during the school holidays? So yes, learning French is part of their daily routine now although as I mentioned above, progress is also a wee bit slow. 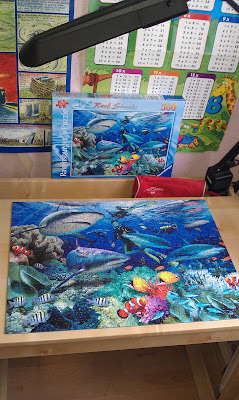 But Okay la..
Oh yes, Before I forget, Little H finished his jigsaw! Here's the finished product! At least somebody has finished something so far! I think it's safe to say that I have made no preparation for Eid yet and this is normal for me, especially since I started living abroad. I think every year it's just, "apa yang dah ada je lah" and as usual, my attempts at kuih raya are always, well, to put it simply, FAILURES! Nope, I've never been good at making raya cookies.. But still, it wouldn't be another raya without ANOTHER attempt at it so I was thinking that I should start looking at cookie recipes after I finish the Quran. However, at the rate I'm reading right now, I won't have any kuih raya this year at all! Okay. So maybe I should start baking 1 or 2 soon. Next week, I think. Will document it here, inshaAllah.. Unfortunately we're not going anywhere as it will be the fasting month soon. As usual when the kids are at home the whole day and night, that means Mama is 'working' the whole day and night! It's not even been 1 week and I'm already feeling tired! And Ramadhan is just around the corner too! For this long school break, I've had a little 'meeting' with my kids (my mother who is a retired school principle taught me how to have 'meetings' with children a long time ago!!) and we've decided what is to be done during the holidays. Big H said he wanted to finish reading the whole Quran this Ramadhan. I told him that he needs to read at least 20 pages daily for that. He said he'll just try anyway..
"So at what time of the day do you want to read the Quran?" I asked. I wanted them to have a timetable and specific times to do all that they want to achieve so that it's more organised and more achievable for them - and also so that Mama can chase them if they're not doing it! "My Muallim said the Prophet said the best time to read the Quran is after Subuh so that's what I'm going to do." "OK." I said encouragingly but dalam hati: MashaAllah anakku...tapi iye ke kau boleh buat ni?? Little H specifically wants to read 'BIG' novels during these holidays. He had already declared to me previously that he 'prefers thick books rather than thin ones' and has already finished the 'BIG' novel that is Black Beauty just yesterday. 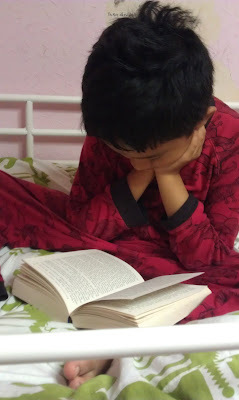 :) Not that he hasn't been reading many thick novels already - he's already finished the whole of the Harry Potter series, mind - no other kids' books gets thicker than them! Both the boys love reading now, mashaAllah, although this wasn't the case last year. So how did I change them? I practically forced them to read books in the beginning - but to me there's no other way about it - I needed them to discover the pleasure that is READING and they needed to do that by reading on their own. I bought books that I thought would interest them, I took them to the library, I encouraged them to read comics i.e. Tintin initially to gain their interest. I set a time at night just for reading. I read with them at first because they like their Mama to read with them. And finally, finally it worked, thank God! After a few weeks of being 'forced' to read, Little H began to get immersed in his story books and later on Big H joined the fun too. Not that Big H didn't enjoy reading before that, mind. He loved reading but ONLY information books e.g. about football, sports, history books, Islamic books...funny, right? During these holidays I let them play a bit on their Wii after dinner until half past 9 by which the rule is to be on their beds reading their books until half past 10. During school days they have to do whatever work from school or normally, from madrasah (as schools here don't normally give homework except for the weekends) after dinner and then it's straight to books as well. Anyway, Little H has a new hobby now which is jigsaw. He's finished one 200 piece one recently and has asked for another one as a present for his good results. Mr S bought for him a 500 piece one - 'upping' the game so to speak - so all the free time he has, he's sitting at his desk trying to complete it! Better jigsaw than sitting in front of the TV playing games and bickering with his brother every free time they have, right? So this is how I intend to have some 'control' over the kids' activities during the holidays. It's going to be tough, what with Ramadhan, the baby, breastfeeding and knowing me, my cravings to eat and cook this and that during the fasting month. Last Thursday the boys' school held a 'Fun Day' - a day of fund raising for the school and for the parents' association, a day for making money and getting rid of unwanted and old stuff for some parents who came and set up stalls in the school compound, and a day of games and spending money for all the children and also parents who wanted to join the fun. Back in Malaysia, from the the tender age of 7, school children were given pocket money to spend at the canteen during lunch time but over here, there's no where to do a spot of 'jual-beli' at school - you either have 'packed lunch' i.e. have your lunch from your lunchpack/ lunchbox your mum packed for you from home, have 'home dinners' which means a parent/ carer would come and pick you up at lunch time to bring you home for lunch, or you were having 'school dinners' which means your parents paid for you to have your lunch at the school dinner hall (in some cases, this could be free if the children's parents were getting benefits from the government - how cool is that?). Basically the children here would not be very exposed to using notes and coins, unless they do so outside of school. Since they were excited about spending money, I was excited too to know what they would buy for themselves. So, I instructed them to write down what they had spent for the day, knowing from previous experience that sometimes they just misplace their coins and didn't spend much or in some cases, they actually did spend their coins, only they couldn't report back to Mama because their young minds have forgotten exactly what they spent on and how much the things had cost. I told them before they went off to school, "Write exactly what you spent your money on and how much - write them down on a piece of paper at school before you forget, okay? Don't wait until you reach home to do it!" The moment I saw Little H running towards me from his classmates and friends when I came to pick them up after school, I knew he had listened earnestly to what I had said. He showed me 3 pencils and 2 rubbers which he had won in some of the games stalls - which, he said, he didn't have to pay anything to participate in - and he showed me that he had £1.04 left over in his pocket. He then began to tell me about his list of expenses which he had written down but said that he didn't want to show it to me first because he had some 'corrections' to do. "Alright." I said to Little H. "Well done, masyaAllah!" Big H however admitted that he didn't do what I told him to do, which was really, typical of him. "It doesn't matter," I said to Big H, "You can write them down at home - try to remember what you bought - start from the beginning!" "Okay.." he said slowly, obviously dismayed that he still HAD to do it! Big H's expenses sheet which he did at home! Little H's explanation of what transpired during the day was complex - he spent a lot of his money on food and drinks but there was also a lot of 'swapping' money - or giving away, really - but my friend didn't have any money so I gave him some! - and then somehow the person whom he gave the money to would also give him a certain amount back! But believe it or not, after all the trading and exchanging he did that day, what he wrote on paper and the amount he had left in his pocket TALLIED!! Which means he had written everything down correctly! Big H however, tried his best to remember what were his purchases for the day exactly but in the end, he had 50p unaccounted for. Hmm..Tu la, Mama suruh buat terus kat sekolah takmau! Right, the boys have gotten their results. And I am happy to say that they have both performed really well this year, for both school and madrasah. Both Little H and Big H achieved a level 'above what is expected of their age group' at school, which is beyond Level 3 for Little H and beyond Level 4 for Big H. For madrasah, Big H came 2nd in class whereas Little H came 1st! Poor Big H - he should have come first for the year because he got first in the first term but due to a little miscommunication/ misunderstanding on his part on what he was supposed to learn in his Supplications, he was short by a few points and the boy who got no 2 last term got no 1!!! Little H had been leading in terms of the marks from last term and from the daily reports he gave me during the exam week this term i.e. semua asyik full marks aje, we already expected him to come 1st in his class, MasyaAllah. I think I should really thank Mr S this time. He was the one who has been hounding the kids to study, testing them at night weeks before the exam and testing them again the nights before the exams. Not to mention texting me on the phone from work to remind me to make sure the boys were studying during their holidays. Of course, that was exactly what I was doing anyway - making sure the boys were not just playing games during the day - but I do appreciate Mr S playing a bigger role in the kids' revision this time around, without me having to prompt him as usual! Thanks Mr S. I know the boys may not understand now - they might complain and whine making things difficult for us everytime we ask them to study, but when they are older and wiser, inshaAllah they will remember our efforts and hopefully they will appreciate it and love us more for it. Amiin..
Saying all that, I was really upset with Little H on the last day at the madrasah - which was also their end of year party and prize giving day. I was waiting outside the madrasah door to pick up the boys, waiting for the Muallim to call the boys for me when Little H and Big H both appeared at the door, carrying a big box each. They both got a big water gun each for their wonderful exam results, apparently. I smiled at them but instead of smiling from ear to ear, Little H had a grimace on his face, and whilst he was still within the Muallim's earshot (not to mention all the parents there who were also waiting for their kids) he said loudly, "RUBBISH, RUBBISH, RUBBISH!" - clearly indicating that he was talking about their prizes! For those of you who have been following this blog previously, you may know that Big H once received a bike for getting 1st in his madrasah class. The year after that, however, the boys did well once again but all they got was a large plastic bag filled with toys each. To be honest, I wasn't surprised that their prizes that second year were just toys because I know how much we paid for the boys' fees, and I can guess roughly how many children there are in the madrasah and I know how many teachers teach there. It's not difficult to estimate their profit and loss account - the madrasah doesn't earn very much - I wouldn't even be surprised if they are a registered charity. So Big H was very lucky that year when he got the bike - a generous and charitable person must have donated them to the madrasah for prize-giving day. Thus really, the boys were fortunate to get anything at all from their madrasah for their hard work during the year. And for Little H to complain loudly like that...I was really embarrassed and of course, angry with him! I quickly told him off quietly, on the spot, telling him it's rude to complain about a gift someone has generously given to you but he wasn't really listening. I then asked the boys to walk quickly to the car, ignoring any more complaints from Little H (Big H wasn't complaining - he had his neutral face on, 'graciously' letting Little H do all the whining!) because there were dark rain clouds in the sky and it looked like it was going to pour any second and since I was carrying Little N, I was obviously concerned about getting caught in the rain. But then I heard Little H say, none too softly, still within earshot of some of the parents; "But this came from a Pound Shop*, Mama!" THAT was when the dark clouds in ME burst open! And do not doubt that there were thunder and lightning too! As expected, I gave the boys a long and harsh lecture in the car on the way home about being grateful and thankful for what one receives and not to be so arrogant and snobbish about receiving less expensive things. And of course, I told them that they're learning at the madrasah to be good muslims, for Allah's reward later, not for the prizes they might get at the end of the year! Little H was very quiet after that and of course, he wasn't in a good mood for the whole evening. He is a smart kid and very eloquent and fluent for his age but that doesn't mean I'm going to let him off for the inappropriate things that might come out of his smart mouth. Saying that, a kid is a kid and he was disappointed with his prize - which he was so excited to receive in the first place, so me being me, I had to 'console' him by showing him and Big H how cool actually their new toys were - they were huge after all and the water jets would go as far as 12m (according to the writing on the box) - you certainly would enjoy shooting at each other in the summer!, I told them. Thank God, that brightened Little H up a bit. And I reminded them that their Papa had promised them a present each for their good results so hopefully both of them will feel well rewarded for their hard work for the year when they receive them. ALL that aside, masyaAllah, alhamdulillah, I am thankful to Allah for the boys' good achievements again this year. Hopefully both of them will work hard to keep it up - Mama will always pray for your success in this life and the hereafter, InshaAllah. Growing up is never easy, boys, and it's NOT just about getting good results. There are many things to learn in life and yet life is short. All I can say to you right now is work hard, be good, pray hard and be humble always and in the end just try your best. InshaAllah, Allah will grant you your prayers. The mouth says it all. It was Big H's birthday yesterday, 3rd July. MasyaAllah he's TEN now! How time flies! If you've followed this blog before this, you'll know that I like to go to town and try to be creative (key word: TRY) with my kids' birthday cakes. Remember these..?? I feel amazed at myself every time I look at these pictures! What a lot of time and energy I had in those days! 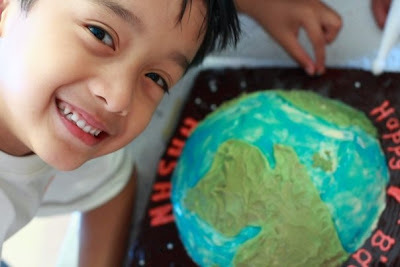 I have not been able to present my boys with any more of my ehem, err..'creations' since, well..I think it's been three years since I last iced a cake and used some of my creative juices to make the kids happy for their birthday! Mak takde taim lah anak-anak semua... Look, look! This was the cake I made for Big H yesterday!! But yesterday we did have a little gathering for Big H's birthday. I wanted it to be the usual quiet celebration at home with the family unit but Big H pleaded with me to invite some people over! Mr S and I relented and decided to invite the two Malaysian families living in our area aje, Kak A's family and I&H's family. We invited them for lunch. All in all it was a nice little get together, alhamdulillah. I'm glad that even with the baby and all I still managed to pull through this time - not without the help of darling Mr S and also of course, the boys! (with a little bit of nagging and screaming involved on my part - as usual!). I do really like to cook for people, I do! It gives me a certain kind of satisfaction to see people enjoying the food that I had slaved in the kitchen to make. I hope this is the start of more invitations to our house this year, God willing! Olympic Basketball place - pic taken from behind some bars - how apt! There has been a lot of traffic jams, roadworks, road closures, bridge closure, bus route changes and not to mention dust in my area for the past couple of years. That's because I live in Stratford, London - that's right, where the Olympics will be held next year. I live just a few minutes away from the Olympic Park. Put it this way, I open my front door and look right, I can see the Olympic Village at the end of my road. I remember when they first started the construction work on the site a few years back - Mr S would have to think many times before washing the car because just 1 day later, the car would be covered in a thick layer of yellow dust. And the dust would creep into our house too. Just a few hours after vacuuming and dusting, the floor would feel dusty, the dark mahogany of the piano would change into a murky lighter shade (okay, I'm exaggerating a bit here ;p) but truly, you could run your finger on the furniture just a few hours after wiping them with a damp cloth and already you would get some dust on your finger! (True Story!). Suffice to say, we had our share of hardships dealing with the huge construction project just a stone's throw away from our place. We suffered but we were also proud and excited to be so close to the action! The Velodrome - so near yet so far! The boys were excited about watching the swimming events and diving events live and I wanted to watch a few of the hockey matches (having played hockey at school) and badminton, hoping to catch Malaysia in action. Mr S was more interested to watch the athletic events and we didn't want to miss the opening ceremony, did we? So, when the tickets were opened for 'registration', we registered for around £1k+ worth of tickets - confident that we would at least get 'some' if not all. In case you didn't know, due to the expected high demand for tickets and in a bid to be 'fair' to all, all UK residents who wanted to attend the events needed to 'register' online for the tickets they wanted to buy and a scheduled ballot would then determine which tickets you would get to purchase. If we were successful in the ballot, we would know by means of our money would be taken out from our account on the 31st May 2011. Mr S checked his account on that date and unfortunately for us, no money was deducted - which means we didn't get any tickets at all, NOT EVEN ONE!! The result was baffling for many people and left many disappointed. For us though, it was doubly so, knowing that we live so near the Olympic Park, (after all we had to go through during its construction!) and reading in the papers that some people got ALL the tickets they registered for (for several events!) when many others like us, got none at all! There's definitely something very unfair about that 'fair' ballot system! It looks like we'll be watching the Olympic events from a TV screen after all. Maybe we should go back to Malaysia during the Olympics and watch from a TV screen in Seremban or Melaka. After all, a TV screen is a TV screen, no matter where you are it would be the same. Or, wait, wait! Maybe I should just boycott the Olympics next year completely and just sulk...no, no, no..I should do my own 'Olympic race' instead! The events would coincide with our holy month, right? So why not I race my grandma/my mom who always khatam the Quran twice during Ramadhan? Come to think of it, what a great idea! And totally impossible to achieve. Sigh. Anyway, one more Ramadhan to go before that one. Here's hoping that I'll be getting a medal for that race this coming Ramadhan, huh? The dude just wants to be a comic artist.